Thanks to Longwood Gardens for putting on the best annual orchid show in town! Here are some favorites from D’s prolific photos — nearly 300 photos this time. We’re in the Conservatory’s spacious indoor gardens and hallways. Imagine the best-kept indoor garden you’ve never had, plus the sound of water flowing and/or cascading down in almost every room. The photo above shows a passage from the main fountain garden to a quieter area. 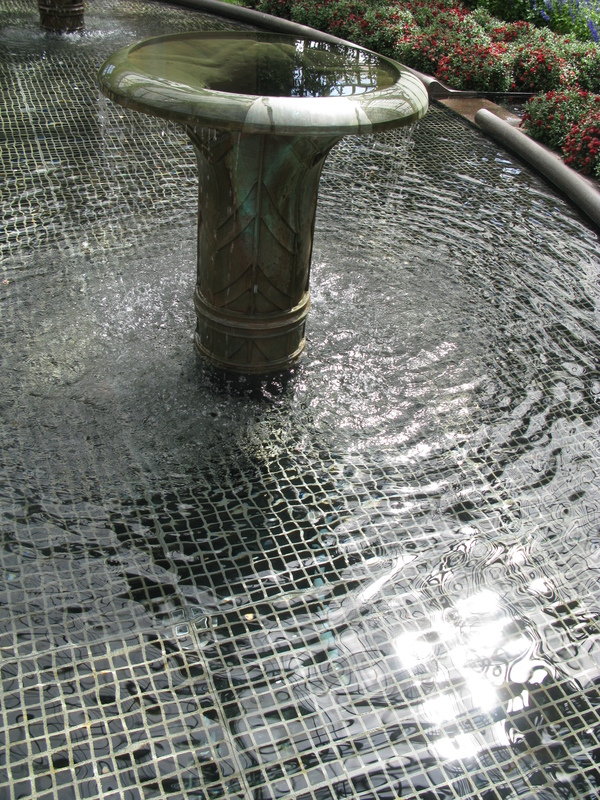 A small fountain at one end keeps the shallow water moving. Potted palms sit in boxes on the pool floor. Chairs and boxes of ivy and small flowering plants line the edge of the pool. Beyond the windows on the far side (above) are water lily ponds still in hibernation. For special events the pool is drained, and furniture set up for elegant programs, dining, dancing or other celebrations. Time for more orchids — beginning with this unusual black orchid from Longwood’s collection. The ‘orchid curtain’ below lines a passageway beyond the orchid room. The second photo shows the same curtain on the reverse side, this time lining a tropical plant garden. They next two photos remind me of college days and orchid corsages. That would be in the 1960s, when an orchid corsage or even wrist adornment was the mark of a woman spoken for! Or at least hopeful. We’ve come a long way, baby! And yes, the orchids were lovely — the mark of a caring gentleman. Several more beauties — a random mix of smiling (sort of) faces and the unexpected. Finally, one last look at three Conservatory paths. First to the orchid room, then through the bromeliad display, and finally around the edge of the main Conservatory entrance. I wish I could capture the sounds and fragrance of this place. Maybe someday…. I hope your day is sunny, filled with fragrant beauty and moments of calm joy. That’s right folks! We visited Longwood Gardens yesterday, where orchids are featured at this time every year. An annual cold-weather reminder that Spring is just around the corner. I’m working on a photo post for later. In the meantime, I voted to write and post this poem today, rather than revisiting last night’s tortuous yet transparent State of the Union address. I will say, however, that it made my heart leap to see so many women willing to step up, step out, and make their presence and voices known at this event. Tomorrow morning I visit one of my heart doctors. Nothing pressing, just a regular checkup with my Lucy Pacemaker doctor. Did you know Lucy collects a huge amount of data on my heartbeats (or lack thereof)? Once a year I get a full report and printout full of charts and graphs. I’ll get one tomorrow. Hopefully I’m at least holding my own. Here’s to a relaxing day/evening/afternoon or whatever it is when you read this poem. Just imagine yourself in your favorite garden or conservatory! Or how about this? I think I’m finally learning to listen to my feet. Not just my heart, gut or kidneys. I emphatically don’t like having to do this. For years I haven’t given more than a passing thought to my feet. Showing up (on my feet) is something I’ve done habitually most of my life. My feet made sure I was on time and prepared. On time and energized. On time and ready to work hard. On time and ready to push that boulder or climb that trail to the top of the hill. If there’s an up-side to this, it’s relief that my feet aren’t scolding me. They’re begging me to pay attention to them. Suggesting I might stop and rest after that glorious walk through the meadow, or that trip to the grocery store. Or I might even give them special treatment the way I give Smudge the cat special treatment every day. If that sounds morbid, so be it. It’s my informal mantra for this coming week. What’s yours? Last June I was newly freed of jaw wires, scraping the bottom of my barrel called Energy, frantic to stop my weight loss. I’m not normally a quick convert to programs described in NYTimes Bestseller Books. But this time I was out of solutions. So I cast myself upon simple yet stringent requirements for Turning My Life Around, as prescribed in one of those NYT BBs. Tuning the heart of the Longwood Organ. Note grand piano ‘pipe’ in the back! I couldn’t decide whether these were miniature Chinese lanterns or fairy lanterns. The fairies won out. They take me back to California and my indoor hanging baskets of fuchsias. Magenta is still my favorite color. Of all my indoor plants, they were the most spectacular. They’re delicate, magical and super easy to grow. I saw these at Longwood Gardens in the Conservatory, where I’d like to be right now. Though the snow outside my window is pretty spectacular. How’s this for a bit of color? On my birthday D and I hiked in the Longwood Gardens Meadow and visited the annual Chrysanthemum Festival in the Conservatory at Longwood Gardens.